The 1986–87 season was the 32nd season of the European Cup, Europe's premier club football competition. The tournament was won by Porto, who came from behind in the final against Bayern Munich to give a Portuguese club its first title since 1962. 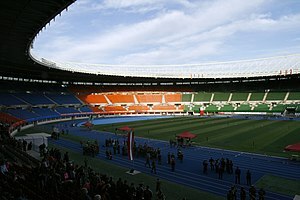 Steaua București, the defending champions, were eliminated by Anderlecht in the second round, having received a bye to reach that stage of the tournament due to the absence of the English champions (Liverpool), as the ban on English clubs in European competitions was now in its second season. Vítkovice won 3–2 on aggregate. Porto won 10–0 on aggregate. Dynamo Berlin won 7–3 on aggregate. Beşiktaş won 3–0 on aggregate. 3–3 on aggregate; APOEL won on away goals. Celtic won 3–0 on aggregate. Dynamo Kyiv won 3–1 on aggregate. Bayern Munich won 2–0 on aggregate. Austria Wien won 6–0 on aggregate. 1 APOEL withdrew for political reasons. Porto won 3–1 on aggregate. Brøndby won 3–2 on aggregate. Dynamo Kyiv won 4–2 on aggregate. Red Star Belgrade won 7–1 on aggregate. 1–1 on aggregate; Real Madrid won on penalties. Porto won 2–1 on aggregate. Dynamo Kyiv won 7–0 on aggregate. 4–4 on aggregate; Real Madrid won on away goals. Porto won 4–2 on aggregate. ^ The Beşiktaş v Dynamo Kyiv match, originally scheduled on 4 March 1987, was postponed due to snow. ^ Beşiktaş played their home match at İzmir Atatürk Stadium, İzmir, instead of their regular stadium BJK İnönü Stadium, Istanbul, due to snow. This page was last edited on 9 March 2019, at 05:09 (UTC).